Wouldn't it be nice if life was organized and managed by the clothes we wore. The office or hospital, I put on my white doctor coat and therefore become Dr. Weisman. I changed to my yoga pants and comfy LLR tee and now, BOOM, I'm Mommy. If only these outfits defined which role I was currently in and nothing else competed with it, right?!? But how many times have I pulled my cell from my front pocket of my white coat to see a text about my children or friend? Or been at home in my favorite black yoga pants and answered pages or completed charts? No matter how hard I have tried, life can't be compartmentalize. All areas of my life overlap one another often. Why? This is self-shame revolving around the false beliefs like "I'm not enough for my family" or "Someone else is raising my children when it should be me" or "If I was enough, I could handle this." These thoughts are deeply rooted in identity, worthiness, self-value, unresolved fear and/or our perception of what motherhood and doctoring "should" look like. How do you define what qualifies as “good enough” for you? Can you really define what will make you “enough”? Are there any double standards you are setting up for yourself? My point is that ENOUGH is undefinable. It is an unreachable point on the horizon. Its definition can be shifting from moment to moment and is absolutely unattainable because in our heads, we change "what is enough" by the second. So know this....you are enough right where you sit! The only person who gets to define your enough is you! I remind myself of this when I start to get all flustered about not appearing "good enough." I tell myself MESSY HAIR, DON'T CARE as a cue to say, "I'm here. I'm showing up. I'm being me and that's enough." You get to make your own definition of enough so own that! You block off the end of the day because you promised a special little someone you would pick them up on-time. Then a call comes in just prior to the phones being rolled over to the call center. Now, you are conflicted between seeing this person or sending them to the ER. If you are like me, I hate turning people away but how can you WIN? Stay, squeeze the person in and leave your child to be the last one picked up yet again or leave, get your kiddo but then think "did I do the right thing by sending them to the ED?" This is where the programming of ‘patient first’ comes into play hard. It starts in medical training that we are taught to place the needs of others before our own. But were was the teaching on how and when do you put yourself, your own health, or your family first? Where was the lectures about healthy boundaries? This climate of "accessibility" for patients is chipping away at our personal boundaries and family time. Patients want us opening our doors earlier and staying later, they want to text us and get immediate answers. But no one is talking about this is uncompensated, inappropriate interruptions of our personal time. No wonder we have trouble with boundaries and feel guilt about turning patients away. There is little help maintaining our personal space (like leaving 30 minutes early one time to get your kid), the unrealistic expectations that we are always doctor first and that we don't need private time. Burnout can break a marriage to the core. 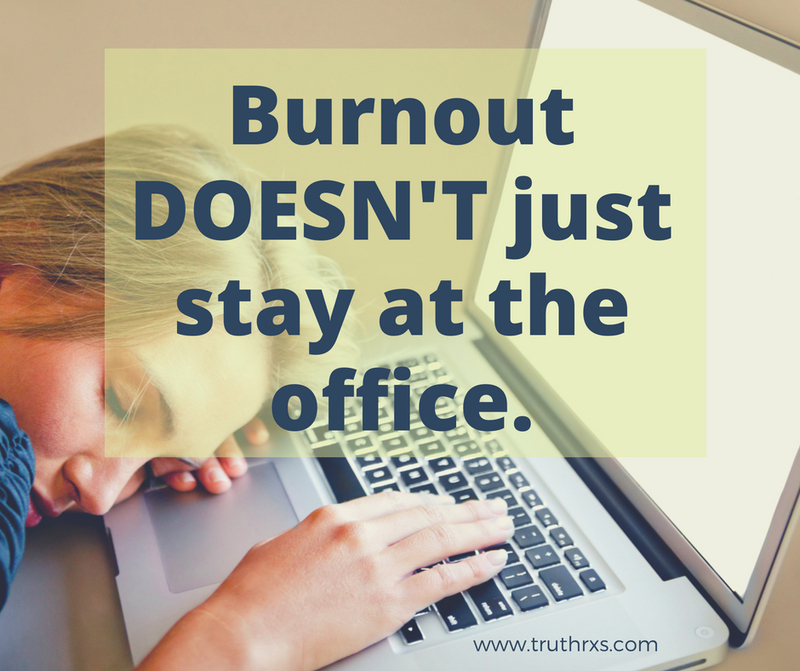 You're already feeling disengaged, exhausted and experiencing compassion fatigue. Then if your support system at home doesn't understand, your marriage could hinder or derail any positive efforts you are making to get better from professional burnout. At one point, I felt like my husband became my roommate and assistant coach rather than my life partner. We were just trying to manage the chaos and throw people back in bounds. I could see why my colleagues are getting divorced, why put up with chaos at the office then have to come home and fight it too! Luckily, my husband admitted he didn't know how to help me but that he would do whatever I needed. What I told him, "I just need you to listen. Don't try to fix me or my job or stuff. Just listen." When he stopped trying to give suggestions and I finally started to open up to him about how I was feeling (overwhelmed, exhausted, fearful, despaired, broken), we experienced a HUGE difference in how we interacted with each other. We hit a breaking point or a turning point and I'm so glad we pivoted!! So no matter where you find yourself, know that you're not the first one to experience any of this. Know that you are not alone! If you want to talk, CLICK HERE to schedule a time to chat with me! Newer PostMy Experience of "Being Coached"